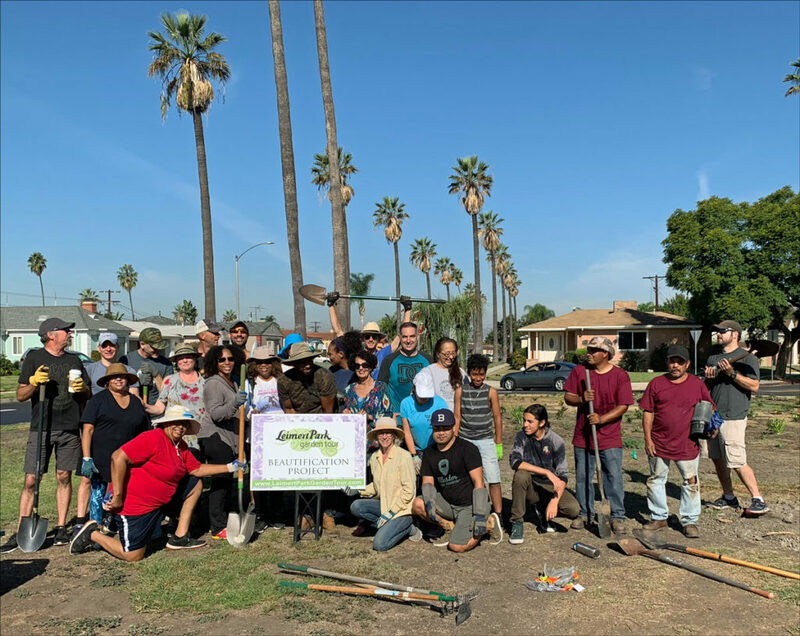 The Leimert Park Garden Tour Committee is thrilled to report that we were able to implement our first Leimert Park beautification project on Saturday, October 27, 2018: the planting of an additional six trees and over two hundred drought-tolerant flowering plants on the Degnan traffic circle median. This median is located prominently in a major traffic artery on Degnan Blvd. just north of MLK Blvd., and is a well-traveled route to the Metro Expo line. GreenArt Landscape Design, Inc. and owner, Brent Green, for the donation of his design expertise and crew. Los Angeles Neighborhood Initiative (LANI) for their generous grant, which, when added to the profits from our 2017 Leimert Park Garden Tour, enabled the purchase of plants and irrigation equipment. The City of Los Angeles Street Services Department of Urban Forestry for its donation of four Jacaranda trees, which provide a visual continuation of the beautiful Jacarandas that line Edgehill Drive. The City of Los Angeles Department of Public Works Adopt-A-Median Department for its help in obtaining the necessary permits. Our generous 2017 and 2019 Garden Tour sponsors: Heather Presha of Keller Williams Realty, 2017 sponsor, and Nia Mallet of Coldwell Banker Brokerage, 2019 sponsor. We hope that you’ll enjoy this new addition to the Leimert Park neighborhood, and encourage you to come out to the second biennial Leimert Park Garden Tour, scheduled for Saturday, May 18, 2019. Check out sneak-peek photos here and please sign up to receive emails so that we can provide you with a occasional email update and ticket sales announcement.